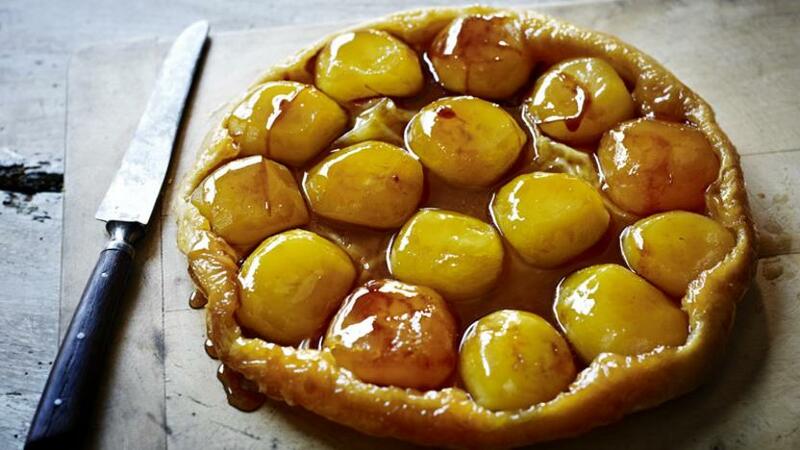 Tarte tatin is one Raymond Blanc’s favourites. Combining the pleasures of dark caramel, crisp pastry and the sweet acidity of apples, it deserves to be served with the very best crème fraîche (“full fat, please,” says Raymond) or vanilla ice cream. Equipment and preparation: You will need a 20cm/8in tarte Tatin dish. Cut the apples in half horizontally, remove the cores and slice off the rounded tops and bottoms of the apples so they sit flat in the tin. Put the water in the bottom of the tin and sprinkle over the sugar. Let it sit for two minutes to allow the water to absorb the sugar. On a medium heat, cook the syrup until it turns to a pale blonde caramel (do not let it become too dark or the flavour will overpower the apples), then stir in the diced butter - this will stop the caramel cooking and give extra richness to the dish. Arrange the apples, middles uppermost, around the edge of the tin and then fill in the centre with the remaining apples. It is important to pack them as tightly as possible – press them down with your hands as you go. Brush the apples with the melted butter and place the tin on a baking tray. Bake in the oven for 30 minutes. Remove from the oven and place the disc of frozen pastry on the top. Tuck the edges of the pastry into the dish and prick a few holes with a sharp knife to let the steam out as the dish cooks. Return to the oven for a further 40-45 minutes, or until the pastry is crisp and golden-brown. Allow to cool at room temperature for one hour before turning out of the tin and serving warm. Alternatively, make the tarte the day before and reheat as above. Braeburn, Cox’s Orange Pippin, Captain Kidd, Crimson Cox, Tydeman’s Early Worcester and Adams Pearmain would all work well in this dish. If you like a sharper flavour, use Granny Smiths but be aware they will give out a bit more juice during cooking and will not cook down as well as the other varieties. This dish is best made a day in advance to allow the pectin in the apples to gel and bind them together. Keep it in the tin after it is cooked and reheat at 150C/300F/Gas 2 for 20 minutes before serving.